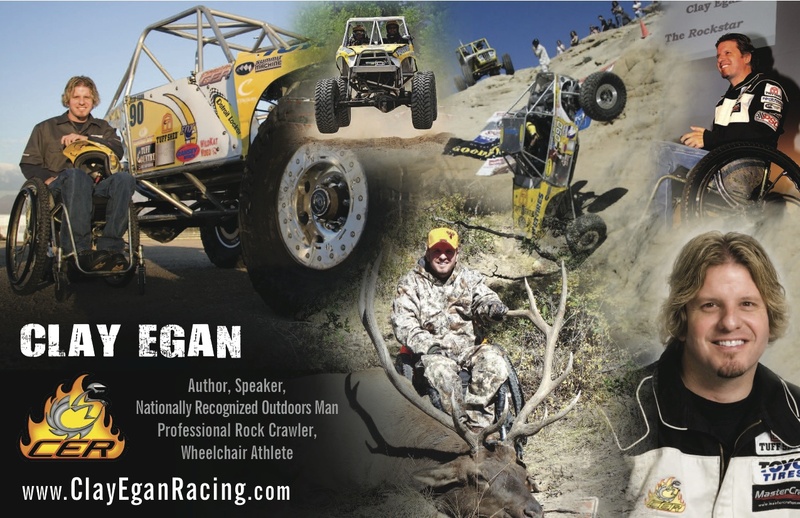 Clay Egan earned the “Worlds Most Inspirational Rockstar” by competing as a Professional Rock Crawler in UROC and WE Rock and has been the only quadriplegic to race in the 2009 Griffin King of the Hammers in Johnson Valley, CA. He is also a very successful wheelchair athlete and extreme sportsman who enjoys hunting and fishing. Although Motivational speaking has been Clay’s focus, he has been featured in Nitro Circus with Travis Pastrana on MTV, has a reality show called Jack’d Up in the works, and has been featured in many commercials, movies and magazines. Clay recently finished his full autobiography, which is a continuation of his 2004 book that is already in print and available for attendees. Clay is also working on a feature film, a full documentary on his life, with an expected completion date of June 1, 2014 in celebration of his 20th anniversary of overcoming adversity. As a certified peer counselor, Clay Egan makes an excellent Inspirational speaker on topics including overcoming obstacles, pushing the limits, never giving up and in the youth groups he adds a segment on choosing not to use drugs. He is motivational to young groups in Youth Facilities, Schools and Educational Camps to adults in large Corporate Events, Religious Retreats, Training Session Breakouts, Association Annual Meetings and more. His professional presentation is entertaining including a fun and visual PowerPoint full of photos and jaw dropping off road videos. Clay’s story will inspire your group to “Push the Limits” and see nothing as an obstacle. 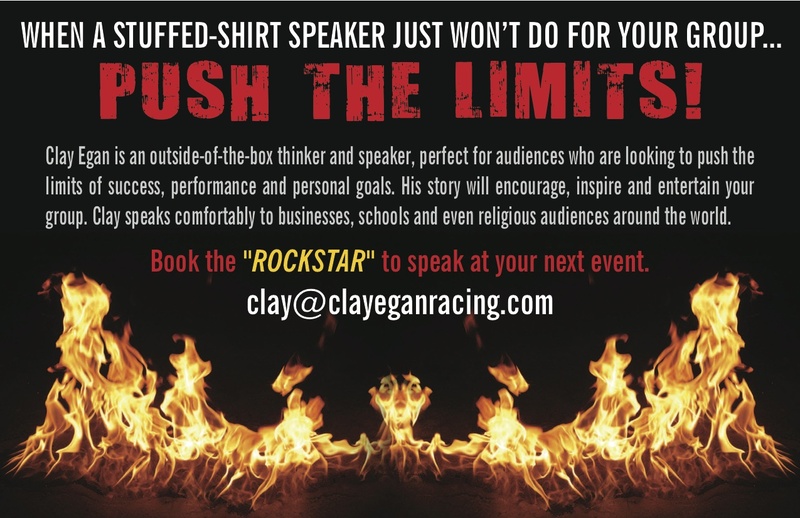 Contact Clay Egan at 801-450-1831, Clay@ClayEganRacing.com, https://www.facebook.com/ClayEganRacing or viawww.ClayEganRacing.com to discuss your upcoming event or opportunity. Or Charlene Bower at 714-394-1716 or Charlene@BowerMedia.com to schedule Clay Egan and other opportunities.